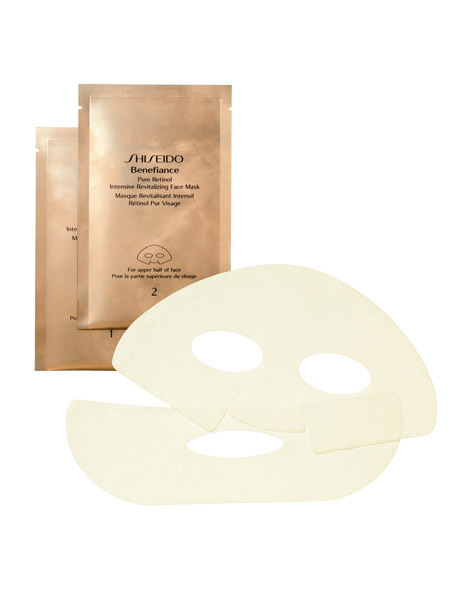 A concentrated treatment sheet mask that encourages skin's natural recovery function and provides a rich infusion of moisture to help improve texture. -Developed with Shiseido-original Pure Liquid Retinol Delivery System, to penetrate skin rapidly and help combat wrinkles, dryness, and dullness. -Formulated with aquatic plant extract Chlorella*, a skin-vitality enhancer. -Contains Hydroxyproline, a high-technology amino acid that parallels skin's own natural building blocks of collagen. -Use after cleansing and balancing skin. -Position the lower piece around mouth area. -After applying lower piece, position the upper piece around eye area. -Leave on for 15 minutes, then peel off. -Smooth any remaining emulsion into skin with a light massage motion. -As an intensive treatment, use 2-3 times a week as needed.